The Season of Lent is drawing to an end. So is our Christ Walk challenge. You will recall that our goal was to cover 3000 miles—a rough estimate of the distance Jesus walked during his 3 years of ministry. Through exercise, service to others, and prayer and meditation, we are well on our way to surpassing that goal! I continue to be amazed at the good things that have happened on our journey together—not only in the accumulation of miles but in increased energy and enthusiasm for life and ministry—as well as meaningful conversations about good health practices that have occurred in our closed Facebook group as well as in face to face encounters. Indeed, this has been a fruitful Lenten Season. Holy Week is upon us. Are we ready? Through the eyes of Luke, we see Jesus entering the city riding on a donkey. It seems such a paradox, doesn’t it? The King of all kings riding on a humble donkey instead of a mighty steed. Is this a simple act or is it, in fact, spectacular? Does this day mark the beginning or the end? 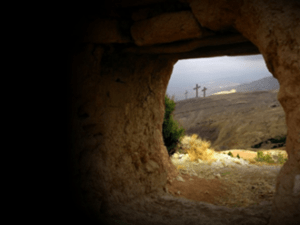 Will it lead to death through a crucifixion or life through a resurrection? With such paradoxes in play, contextualizing the message becomes all the more important. In Biblical studies, contextualizing the message refers to understanding what is being said in Scripture in light of what’s going on at the time. After 2000 years, things can become a bit muddled. Sometimes, particularly with familiar passages like today’s Gospel reading, we are tempted to rush through the story and paint the canvas of 1st Century Jews with our 21st Century brush. If we do, it is our loss. Allow me to demonstrate: Imagine with me for a moment…Eve Renfroe and I go for a little walk in her beautiful back yard. Then, in a moment of hushed surprise, we trade in the blossoms and greenery for another time, another place, another garden. We find ourselves walking in the Garden of Gethsemane in the days of Jesus. Eve turns to me and says, “Glenda, I really like the prophet Jesus. He tells stories of God’s love that speak to my heart and soul. Don’t you agree?” And I answer, “Well, yes, and I am dying to learn more about him and his movement. In fact, I’ve thrown out my Hebrew Scriptures and traded them in for a pocket-sized New Testament I just got from Amazon. Let’s sit here for a while and read it together.” Somehow, I don’t think 1st Century Jews had pocket testaments—of any sort. In fact, they probably didn’t even have pockets! From time to time we need to be reminded that while we, as a New Testament church are quite familiar with the Gospels and the writings of Paul, things are different for the people in 1st Century Palestine. The stories that the Jewish people, including Jesus and his disciples, hold dear come from the Law, the Psalms, and the prophets. What they hear during worship and in their homes become the stories that help them interpret life around them. Like them, we are informed, comforted, and called back to God’s grace through biblical faith stories, but we mustn’t assume that we experience these stories in the same way as the people who were there. It would behoove us to stop long enough to remove our “enlightened” glasses to take a closer look. The people who catch the royal symbolism of Jesus’ act, spread their cloaks on the road and they worship Jesus, the Suffering Servant, as he rides into Jerusalem—not on a beast of war, but on a beast of the people—a donkey. And just as the donkey is known for its stubborn nature, Jesus, too, is determined. He will not turn back. Jesus has a message of God’s Kingdom to deliver, and he will deliver it. Recall the words of Isaiah: “I did not turn backwards, I gave my back to those who struck me, and my cheeks to those who pulled out [my] beard…I have set my face like flint….” Jesus, who could have turned back, who could have called down legions of angels, instead sets his face to enter Jerusalem. Yet, the Messiah will fail to fulfill the expectations of the crowds. They want a warrior king to rescue them from their physical state. But Jesus has bigger plans in mind—holy plans—unbelievable plans. On this day, this portal into Holy Week, we reenact Jesus’ entry into the city of Jerusalem. 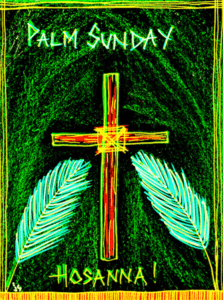 We process into the church waving palm branches and we remember with joy, Jesus. We, too, lift our voices in praise. Still, even though we know Jesus will not be held in the grave forever, we wrestle with the mysterious paradox of Christ’s nature—both human and divine; both a humble king who does not overpower his followers and a king who is able to empower his followers for the work of his Abba Father; both obedient and victorious; both crucified and resurrected. Hear again the praise of the people: “Blessed is the king who comes in the name of the Lord! Peace in heaven, and glory in the highest heaven.” For Jesus, this day of joy carries a hint of sorrow because he knows that the joyous crowd will soon be replaced with an angry mob. The cloaks and palms will become a crown of thorns and the donkey which bears Jesus into the city will become a cross, which he himself must bear. And words of praise will be replaced with shouts of “Crucify him!” Jesus knows that anyone can sing a word or two of praise. The eager crowd may use the right words, but they miss the point. After all, simply knowing the truth is not the same as doing the truth. Our words must match our actions. As modern-day Christians, we are challenged to tell the story of Jesus and to show his love to a world that is free even though they live like they are still in captivity. Our task is to tell the old, old story in new and inviting ways. As a church, how are we doing? How is our Christ Walk influencing others for love of Christ? Might we meet the challenge through lively worship that recognizes God is the audience of our praise? It’s not about you! It’s not about me! Might we meet the challenge by showing welcome and hospitality to everyone who enters our doors? Might we meet the challenge by finding new ways to engage with people who are unchurched? Might we meet the challenge by continuing our Christ Walk experience through service, prayer and meditation, and through taking care of ourselves so we may better care for others? As a community and as individuals, our Christ Walk journey compels us to put feet to our faith; to find new ways to share our love for Christ—in our church, in our homes, in our community, and in the world. Blessed is the king who comes in the name of the Lord! Peace in heaven, and glory in the highest heaven. Sing Hosanna, dear Christians! Shout Hosanna! It was only six days before the Passover. Although they didn’t know it at the time, soon their Lord would be hanging on a cross. Naturally, they had heard rumors. While Jesus’ prior activities—all his teaching and miracles—had gotten the attention of religious rulers, things came to a head when he raised their brother, Lazarus, from the dead. You see, many Jews who witnessed the miracle became believers, too. And when the chief priests and Pharisees heard, they called a council meeting to decide the fate of Jesus. News of Lazarus being brought back to life spread throughout the land. People from far and wide came to see the living miracle with their own eyes. Always a bit shy, Lazarus was overwhelmed by it all: the sudden illness; his trek into the valley of death; strangers flocking to see him; and now there he sat beside Jesus. Because Martha, Mary, Lazarus had a large home, they tried to live by the Jewish teaching of showing hospitality to strangers. They were taught that by doing so, they might be entertaining angels of God. Little did they know, when Jesus became their dearest friend and frequent houseguest, it was more than angels of God they were entertaining. Oh, the good times they had—such joy and laughter. Jesus taught them so much—taught Martha so much. Before she met Jesus, Martha was set in her ways and could be harsh and judgmental when things didn’t go according to her plan. (She was, after all, the eldest sister.) No doubt you’ve heard the story, the story of Jesus going to her home to dine and Martha working away, playing the role of the perfect hostess. But when Martha saw Mary sitting there at Jesus’ feet as if she had nothing better to do, Martha was annoyed and judged her sister—judged her for not helping—judged her for sitting there oblivious to all the hustle and bustle. Jesus showed Martha the error of her ways, though. Jesus showed her a better way to live and move and be in the world. Like most people, sometimes Martha was better at seeing the speck in someone else’s eyes. But Jesus taught her that God provides a variety of gifts for the common good. Though Mary and Martha were sisters, they served the Lord in different ways. While Martha’s gifts were hospitality and service, Mary’s gifts were learning and discernment. Truth be told, Jesus broke all the rules of tradition by encouraging women to learn, to study, to pray, and to grow in faith and love. In the eyes of Jesus, there was always room for one more at the table. Jesus loved and valued everyone. Period. In all that he said—in all that he did—Jesus embodied love, acceptance, and wisdom. No wonder Martha, Mary, Lazarus were always glad to see him at their front door. And since their little town of Bethany was only a couple of miles from Jerusalem, Jesus and his disciples were often in their home. But one evening stands out—the evening they had something incredible to celebrate! Of course, Mary and Martha were distraught when Lazarus became ill. It all happened so fast. One minute he was fine—and the next—he wasn’t. Not knowing what to do, they sent for Jesus. Tell him, “The one whom you love is ill.” But Jesus did not come. Jesus did not come until after they laid the lifeless body of Lazarus in a tomb. As soon as Martha heard Jesus was on the way, she ran to meet him. With tears in her eyes, she told him if he had been with them, Lazarus would not have died. “But even now,” she said, “I know that God will give you whatever you ask…I believe that you are the Messiah, the Son of God.” Then Jesus, their friend, their Teacher, their Lord, went to the place where Lazarus was buried and did more than they could have ever imagined. He called Lazarus out of the tomb. Wrapped in burial cloths from head to toe, their brother walked out of his cold, cold grave. They were astonished. They were overwhelmed. They were filled with joy. Certainly, a celebration was in order because they wanted to share the news with everyone. But Jesus was being watched closely by the religious authorities and they soon learned through the grapevine—Lazarus was in danger, too. So, they planned a small, intimate gathering to honor Jesus. Martha was busy waiting on their guests, filling goblets with wine, and bringing in fresh bread. Suddenly, she noticed something in the air—a rich, sweet, fragrance. Turning, she walked back into the dining area. 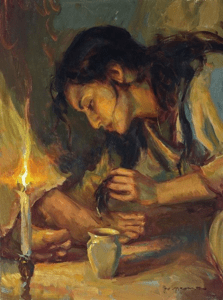 Lazarus was sitting beside Jesus and her sister was kneeling before the Lord, drenching his feet with perfumed oil, and wiping off the excess with her hair. It was one of the most beautiful, gracious things Martha’s eyes had ever beheld. The alabaster jar Mary cracked open was quite valuable, but Mary knew this was the time for a lavish gesture of love. Even though Jesus had warned his disciples that he would soon die, they did not understand. But Mary with her spiritual sensitivity—she recognized the imminent suffering and death of our Lord. She understood and with her whole heart, she gave all that she had. Judas and Mary—what a contrast! Judas was a thief, a false disciple, a betrayer. Mary was generous to a fault, a true disciple, a friend of Jesus. Generosity! Abundance! It was a lifestyle for Jesus. Why shouldn’t Mary reciprocate in kind when she had the resources to do so? In that moment, she modeled how being a disciple of Jesus Christ should cost something. And in that moment, Judas modeled the price people may pay for judging others unkindly. After all, ridiculing, demeaning, and judging others can become a habit—a habit that reveals more about the person pointing the finger than anything else. Such negative behavior can keep folks so busy focusing outward, they don’t spend time sitting at the feet of Jesus; they don’t grow in their own Christ Walk. In the end, the change people want to see in others may really be the change that is needed in their own hearts and minds and souls. Dear church, are you spending time at the feet of Jesus? If not, please hear me. Jesus loved being in the home of Martha, Mary, and Lazarus and, surely, Martha was humbled to serve him. He was her friend and she never doubted his love. Yet when Jesus returned to his Abba Father, I can’t help but wonder if she wished she had spent less time doing stuff for Jesus and more time sitting at his feet like her sister. Perhaps, in time she recalled how Jesus made a habit of going away for a time of prayer and rest, then returning filled with a deeper peace and joy. Maybe the Spirit gave her a similar desire—to live a more balanced life just like Jesus did—so that she could have that peace and joy—in her doing AND in her being—all for the sake of Christ. Is your Christ Walk filled with peace and joy? Are you seeking ways to balance doing and being? Are you taking care of your own spiritual, physical, and mental needs so you can care for others? Resurrection morning is drawing nigh. Are you ready? [ii] Resources: Carlos Wilton, Lectionary Preaching Workbook, 138. [iii] William G. Carter, Feasting on the Word, 144. In recent weeks, our readings from the Gospel of Luke have had a common theme: the urgent need to repent. Today’s text or pericope places us at the end of a series of parables—also sharing a common theme: how God receives the sinner’s repentance. In the parable of the lost sheep, the shepherd loses one of his 100 sheep and goes into the wilderness to find it. Once it is rescued, the shepherd calls all his neighbors together for a celebration. Now we turn our attention to the third parable in the series. It is one of the most well-known stories of the New Testament, commonly referred to as the Parable of the Prodigal Son. This parable offers us an opportunity to learn something about two brothers, as well as ourselves. But more importantly, if we have eyes to see and ears to hear, we will realize more fully the love of our Abba Father—a great, generous, even prodigal love. With his father alive and well, the son goes to him and demands his inheritance. In Jewish culture, such a request is tantamount to saying, “I wish you were dead.” Nevertheless, the father agrees and divides his property between his two sons. The younger one takes his inheritance and squanders it in riotous living until, finally, he finds himself without a dime to his name, nowhere to live, nowhere to turn. In desperation, he gets a job feeding the pigs. In truth, he is so hungry, he would gladly eat the pig’s food. But then he comes to himself; sees himself for what he really is. It is in that pivotal moment that his true repentance begins—as he turns to take that first step toward home. For years I’ve slaved for you, never once leaving you or causing you any grief and you’ve never offered to throw a party for me and my friends. Yet, this son of yours who has wasted your money on who knows what, shows up after all this time, and you have the audacity to throw a big bash like this! In a Sunday school class he taught on this parable, Fred Craddock offered a different version of the story: The father puts the robe and ring on the older brother; the reward goes to the one who stays behind as the dutiful son. It’s for him that the father kills the fatted calf and throws a grand celebration. Craddock said that after he described this alternate version in the class, a woman seated near the back shouted out, “No, but that’s how it should have been!” Not at all what Craddock expected! But then, truth be told, what happens in the story isn’t what either one of the sons expect—for they both expect about the same thing we would—that the son who has squandered his inheritance has gotten what he deserves. It’s about time he learns his lesson—bad behavior has consequences! Oh, he can live here, he can even have his old room back. But out in the fields he will go until he learns his lesson; until he earns—you heard me—earns—his place at the table again! In the setting in which Jesus tells the parable, the behavior of the oldest son represents the ungracious attitude of the religious leaders who have been complaining about with whom Jesus breaks bread and spends time. Like the older brother, they feel they’ve earned their positions in life and “those sinners,” well, they got what they deserve. We, too, may be guilty of acting like the religious leaders—especially if we have the tendency to draw lines in the sand to mark who is in and who is out. But a word of warning is in order: Drawing lines to exclude folks can be risky business because Jesus is notorious for being on the other side—on the side of the outcast, the downtrodden, the excluded! Through the eyes of Jesus, we see our Abba Father as a God of deep, abiding, boundless, even desperate love for those created in God’s image—for us. It is a love that comes in search of us; a love that allows for humanity’s free will; a love that is vulnerable. As I look back, I am humbled by the good things God has given us to celebrate as a family. But for the life of me, I cannot recall one time we had a party to celebrate anyone’s failure. Had one of our children brought “shame to the family name,” I can’t imagine us even thinking about a party. But the Prodigal, Generous Father—he will stop at nothing to welcome home the son who was lost. What extraordinary love! Even though the youngest son insults him by asking for his inheritance early, even though the son has been gone for who knows how long without a word, even though he loses everything and ends up bedded down with unclean pigs—still, when the father sees him coming over the ridge, he breaks into a run. He can’t get to him fast enough. It’s as if the father has been keeping vigil, praying for his son night and day, hoping against hope he might return. What scandalous grace is this! God’s great embrace, God’s love, compassion, and justice are deeper and wider than our hearts can imagine. God our Father is watching, waiting, and hoping that we will rush into his arms and remain there now and forevermore. Amen. 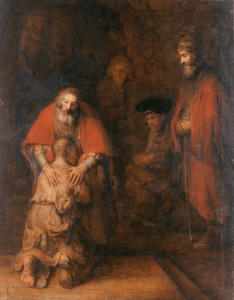 [iii] Henri Nouwen, The Return of the Prodigal Son, 55.